In life, as in art, the lure of the new is difficult to ignore. By its very definition, fashion consists of what's new and now. However, I've found that sometimes the best inspiration comes from dusting off a favorite book, pulling on some worn-out jeans, or having a conversation with an old friend. I've been revisiting one of my very first favorite artists recently. I grew up loving Salvador Dalí like many children, and was just as fascinated with the burning giraffes as I was with the melting clocks. Looking into his early work this week, I came across Barcelona Mannequin from 1926. I was immediately inspired by the bold primaries, nautical imagery, and fashion world stance. Another work from this time period, Still Life by the Light of the Moon, contains similar imagery and color palette. It's intriguing to see Dalí's interpretation of Cubism as well as the very beginning of Surrealism. 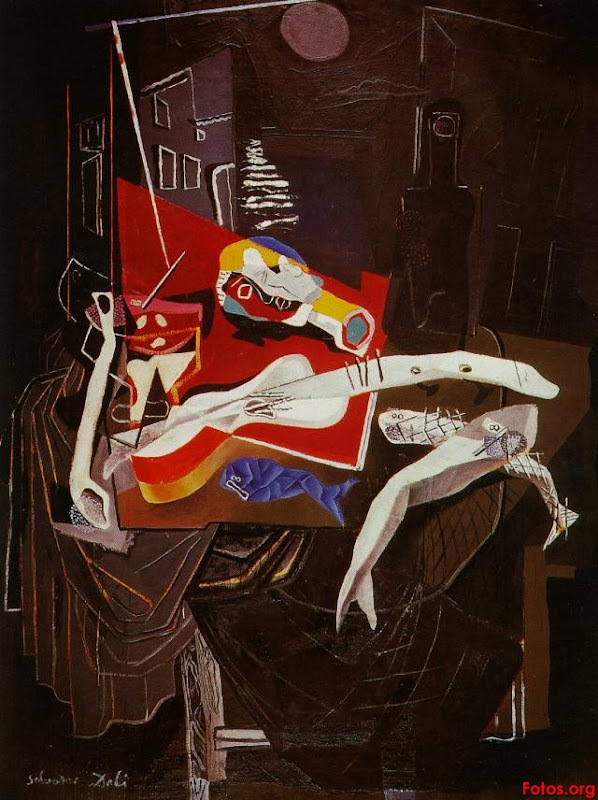 These were completed only 4 years before The Persistence of Memory, which is widely regarded as his masterpiece. By 1936, Dalí was deep into Surrealism, both as a lifestyle and an art practice. It was that year that he created my favorite piece, Lobster Telephone. 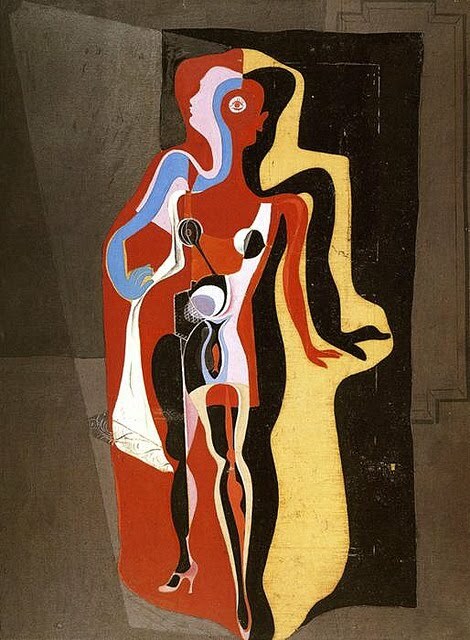 I wouldn't mind authoring an entire blog solely on the topic of Dalí as fashion inspiration! I thought these pants, with their sailor-inspired front placket, were perfectly suited to carry out the nautical theme. I think this is the very first time I've ever worn suspenders! If you look closely at the painting, my shoes resemble the ones the Barcelona Mannequin is wearing. I'm wearing a vintage silk blouse, no name suspender jeans I found at Goodwill, L.A.M.B. shoes, Marc by Marc Jacobs bag, and L.A.M.B. watch. P.S. Thank you for your patience while Artfully Awear undergoes what I hope will be some improvements! i LOVE the dali inspiration and those fabulous pants! That watch is awesome! Inspired to internet-shop for a L.A.M.B. watch now. I'm loving the colours here, Ariel! (: I have missed visiting your blog; I love the layout! 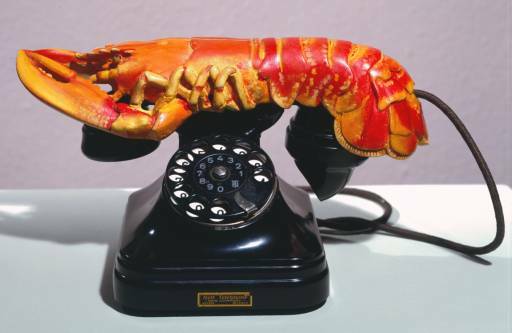 i love the lobster phone! and those shoes are too cute. I love, love, love Dali! Your Dali inspired outfit is a treat, the inspiration definitely shows through! The top and shoes are wonderful. I like your look! Great pics and post!! !